Poppy Seeds- Can they get you high? Poppyseed is highly nutritious seed (and oil) that has been used for thousands of years in international cuisine. It is used in hundreds of different dishes, from main course to dessert, and is most commonly found in pastries or bakeries, and then there’s the American favorite- the Poppyseed bagel. Poppyseed is high value- it costs nearly 3x the cost of hempseed per pound, and 60,000 tons are produced annually, globally. Perhaps the only food product besides hempseed that is also regulated under the Controlled Substances Act (CSA) is Poppyseeds. Believe it or not, edible poppyseed comes from Papaver somniferum, commonly known as the Opium Poppy. There are hundreds of varieties of Poppy, many are ornamental flowers, others can be noxious weeds (the State of West Virginia classifies Poppy as such). However, it is Opium Poppy that poppyseed comes from. So…… WTF??!! HOW in the world does that work?!?! The CSA classifies Opium and Opium derivatives as a Schedule II narcotic, which means that, unlike Medical Marijuana, the Government actually produces opium in quantities to supply doctors and hospitals for Morphine and Heroin. However, I think that most opiates these days are synthetic, and Opium production is generally banned throughout the world. 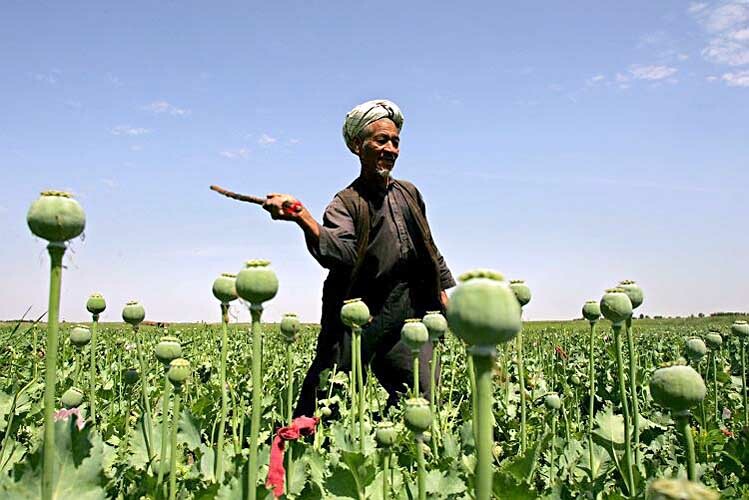 Afghanistan produces the over 90% of the world’s opium, although just a few years ago, there was a very strict ban, under the taliBAN. The Czech Republic is listed as producing the most Poppyseed of any other country, but this does not seem to correlate to Opium Production. Most medicines are now made, not with the latex sap from the Opium Poppy, but from “Poppy Straw”, the stalks of the plant, from which morphine can be extracted. This is a by-product of seed production. Imagine if there was a hemp field, and after the seed was harvested, you could smoke the stalk! The fact is, this is NOT the case, but with Poppy, this is EXACTLY the case. The main thing that turns a legal Poppy field into an illicit Poppy field, is whether or not the budding flowers are “Scored”. To make Opium, a farmer will use a knife to create a cut in the bud. From this cut will ooze or bleed, a white latex sap that is the Opium. If these scores are not made, Opium is not collected. However, like I said, Poppystraw, a controlled substance, can be used to manufacture opioids. So, producing Poppyseed DOES actually produce opiates: they are the same genus and species and variety and cultivar, it is called the opium poppy. If you ate enough poppy seeds, you could hypothetically get a buzz, and you would definitely fail a drug test. IRONICALLY, producing hempseed does NOT produce marijuana as a byproduct, will not make you fail a drug test, the genetics are very different, as well as farming methods and even physical appearance.